We struggle through long lists of Hebrew names as we read the catalog of cities and kings that would be subject to the Israelites. 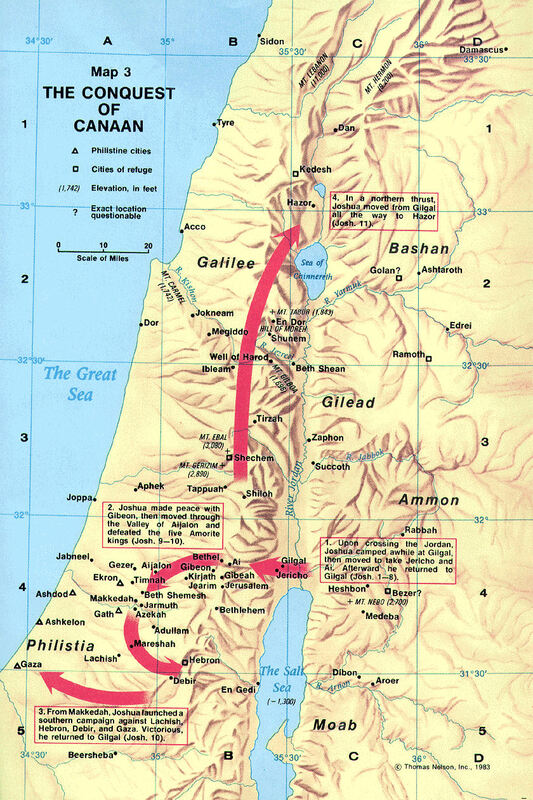 We also discuss the faith of Caleb in asking for Hebron, a city owned by the Anakim (descendants of the Nephilim), as his family’s portion, and contrast that with the complaints of the tribe of Ephraim and the half-tribe of Manasseh, who were apparently unhappy with their allotment because the Canaanites in the lowlands had iron chariots and the hill country was full of trees. For great maps to help visualize the locations described in the Bible, see this collection of maps in the public domain and these high-resolution Bible study maps. Tried to download #53 Joshua 12-17 and get ‘can’t find webpage’ message. Hi, Roger: Thanks for catching that! Yes, and it has.